Cruising through the rugged wilderness of Alaska’s Glacier Bay National Park was one of the most photogenic experiences we’ve had all year. The day in October that we traveled through the scenic waters will go down as a highlight in all of our travels around the world. 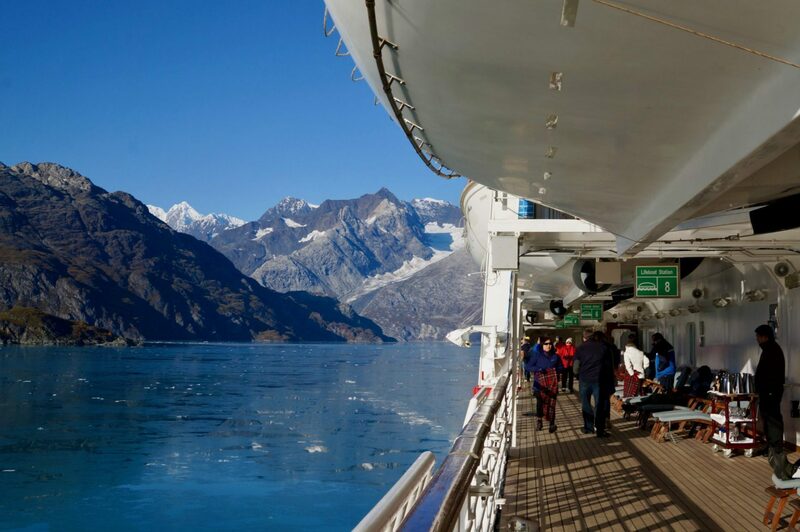 Slowly entering the calm and pristine bay, surrounded by mountains and glaciers is an awe-inducing experience. We often write detailed, info-packed articles about our adventures and tips for the destinations we visit. But in this post we’re going to take a detour from that. We’ll (mostly) let the pictures speak for themselves while recounting the day. Of course, we’ll still spill a quick review and tips. We took a grand total of 357 photos in all. The natural beauty here makes photography effortless. We now share some of these favorite shots as travel inspiration. The wilderness throughout this National Park and UNESCO World Heritage Site is spectacular. It is raw Alaska at its finest. 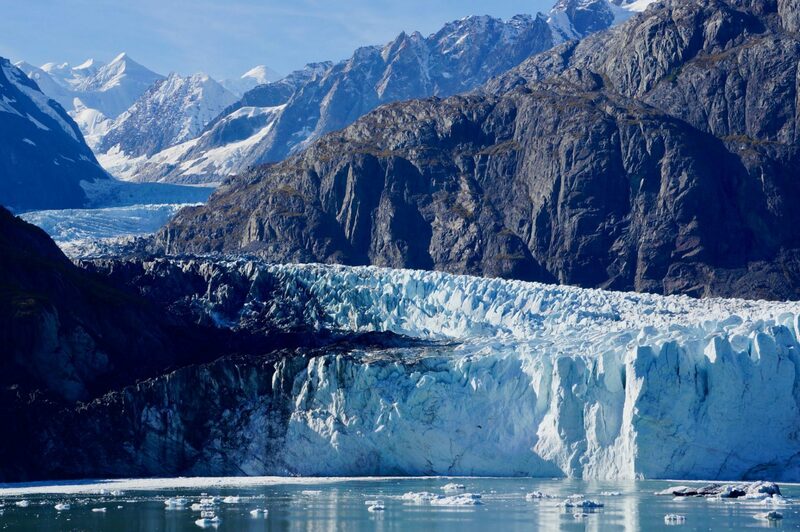 Cruising through the waters of Glacier Bay is an inspiring bucket-list trip that we highly recommend as a fantastic voyage for any nature lovers. 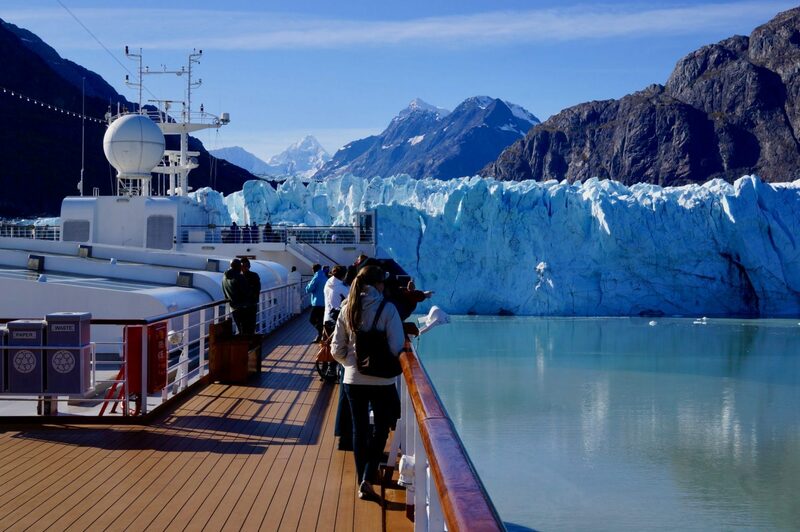 Our visit into Glacier Bay was entirely on a cruise ship. This is actually the most common way that people experience the out-of-the-way National Park. 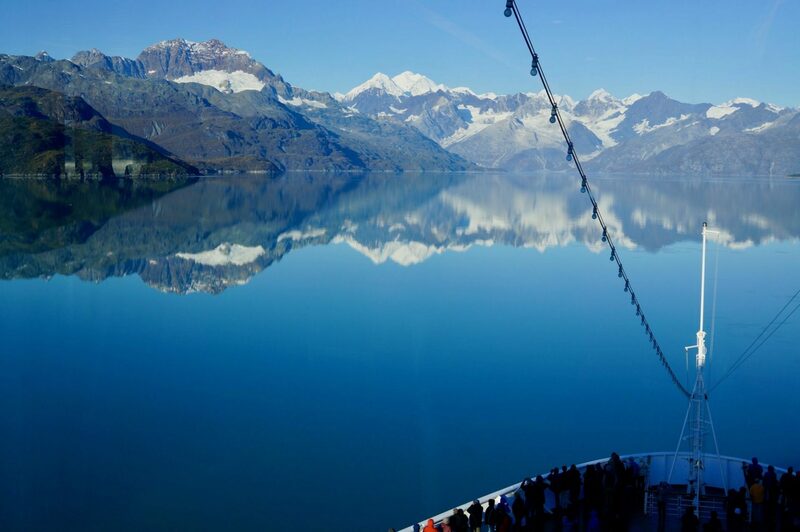 We weren’t certain how much of Glacier Bay we’d actually be able to see by simply leaning over the rails of a big ship. But we soon discovered there was an immense amount of raw beauty to experience without even stepping foot off the ship. 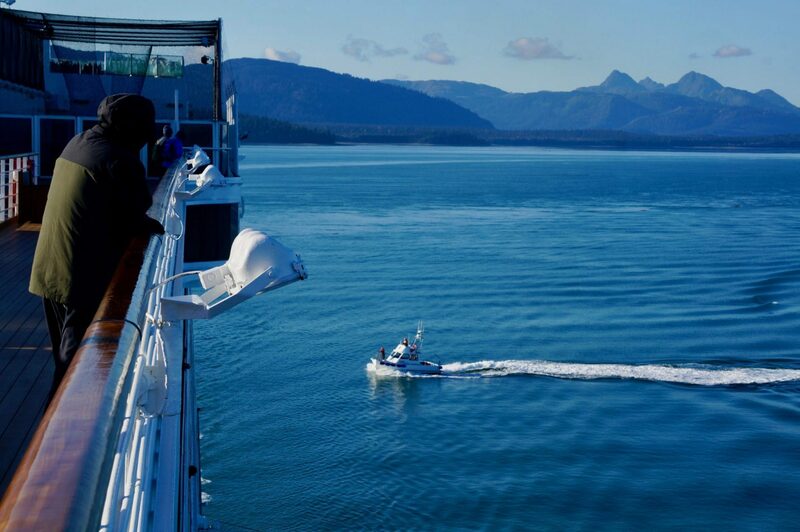 Overnight the crew of the Holland America Volendam had slowly navigated us 65 miles from Juneau through Alaska’s inland waters. It was early in the morning when our ship pulled into the mouth of Glacier Bay. We awoke to looming Alaskan mountains outside our stateroom window. That alone filled us with enough excitement to race towards the upper decks for a hot cup of coffee amidst the icy views that were slowly beginning to come into focus. It wasn’t long before we could see Mount Fairweather. 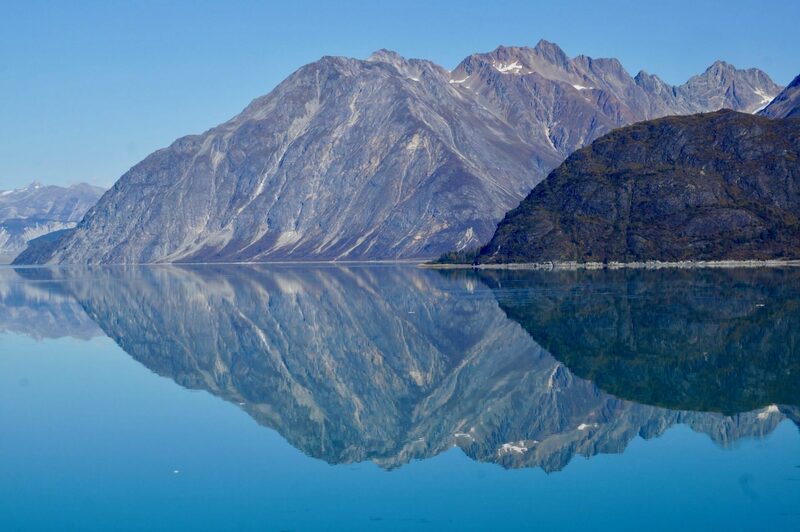 This is one of the tallest coastal mountains in the world, soaring 4,671 meters (15,325 feet) up towards the sky. The mountain seemed appropriately named during this morning, as the weather was indeed fair. Morning fog and low clouds were fleeting, unveiling bright blue skies. Back in 1778 Captain James Cook sailed into these waters under similar weather conditions, giving Mount Fairweather its name. Pretty soon a boatload of US National Park rangers joined our ship. We were amazed to see a smaller boat pull right up alongside us. A rope ladder was extended for each of them to crawl onto the ship like pirates. But instead of pillaging our ship, it was backpacks full of treasures that they were actually bringing on board. We were impressed to see the rangers set up an entire makeshift visitor center in one of the Volendam’s lounges. 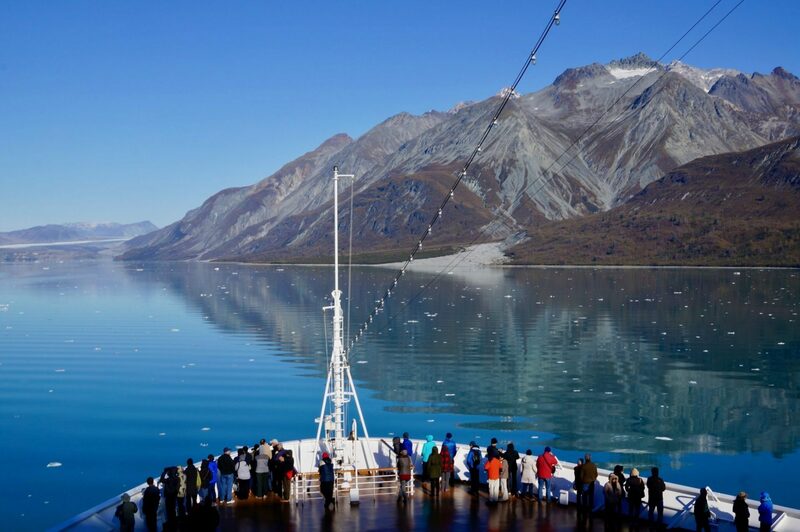 Being the beginning of October, this was the final cruise of the season to enter Glacier Bay. No big ships will come into these waters again until May. You could sense the excitement in the park rangers as they entered the lounge. One remarked that the sunny weather we were experiencing was a 1-in-100 chance for this time of year. He commented how the ice-capped mountain range in the distance often isn’t visible. It didn’t take long to begin spotting wildlife. Getting deeper into the icy bay waters, a pair of orca whales briefly popped to the surface in what seemed like a friendly greeting. Dotting the craggy cliffs alongside the ship, fuzzy white balls were moving around in the distance. A pair of binoculars revealed this to be mountain goats scaling the rocky coastline. It was a novelty to actually be able to spot wildlife on land from the ship, even if it was from afar. 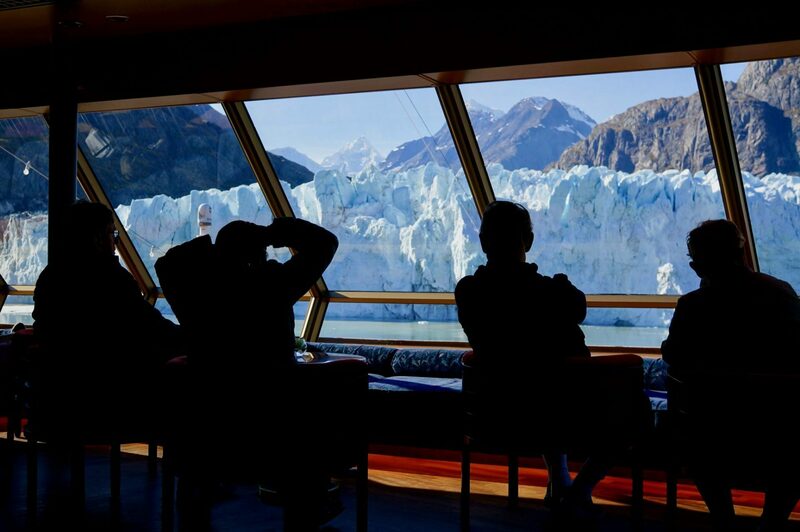 Sometimes passengers even see bears while cruising through Glacier Bay. We weren’t that lucky. 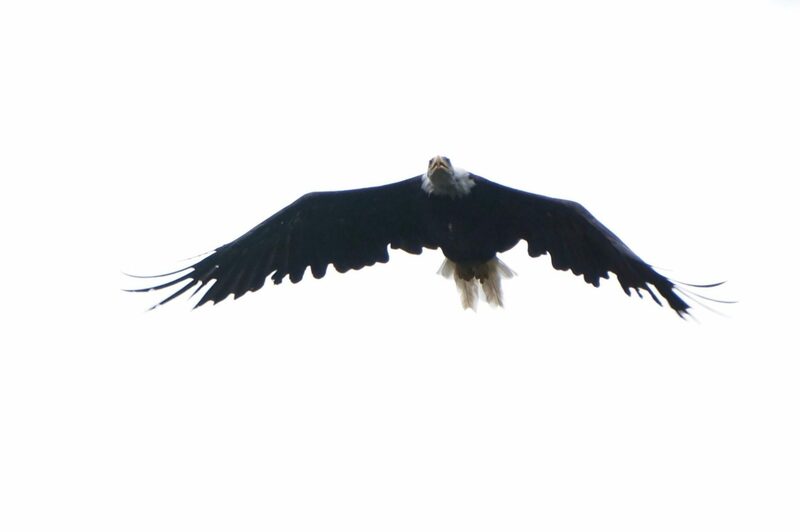 Although we did see plenty of frolicking harbor seals and even an iconic bald eagle soaring overhead. But the wildlife isn’t the main attraction. 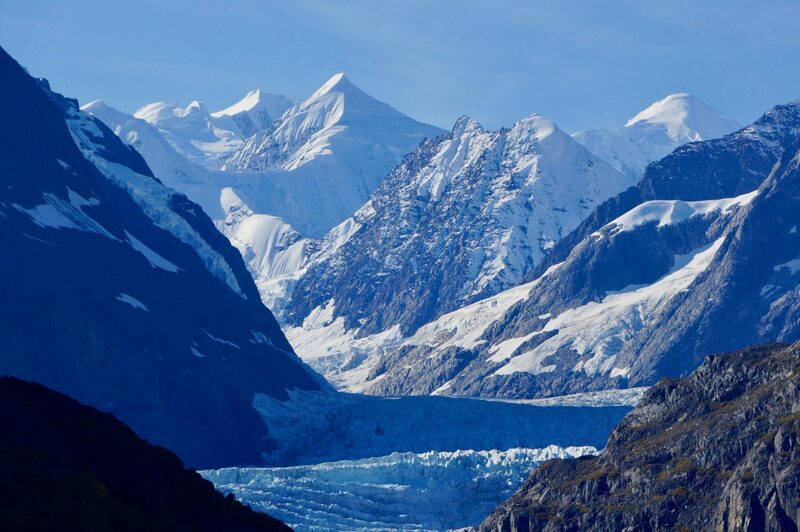 It’s the namesake glaciers that draw people to this special place in the world. 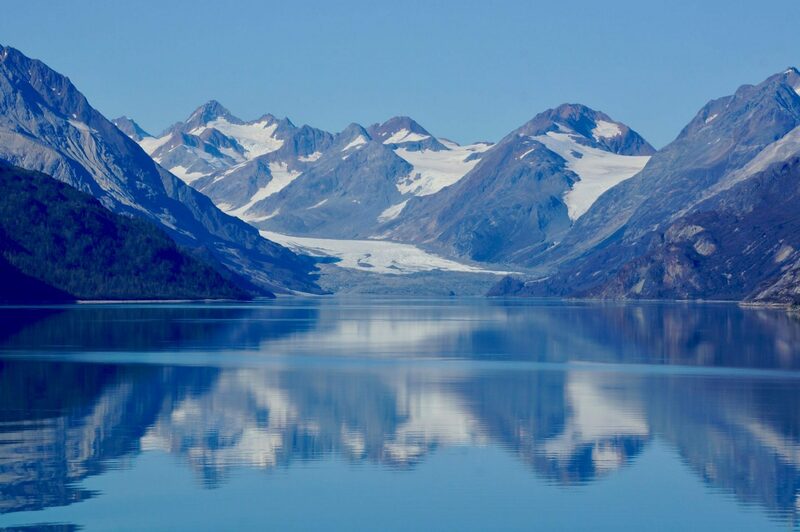 What Glacier Bay National Park is known for is its “tidewater glaciers.” These are glaciers that extend right down to the ocean, a rare feat for glaciers since they are often found in high altitude mountaintops. 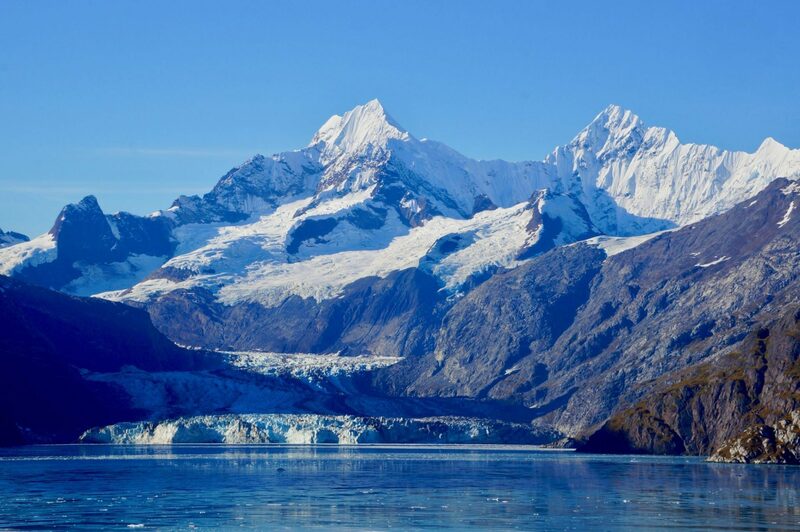 Glacier Bay National Park is unique in that it has the most actively calving tidewater glaciers in the world! As we journeyed deeper into the bay, the ice in the waters was becoming thicker. It was sparkling in the sunlight as if someone had scattered glitter into the bay waters. It was also an indication that we were nearing the glaciers producing these glimmering icebergs. The passages around us were becoming tighter. We were amazed at how close the cruise ship would get as it carefully plowed through the iceberg-filled waters to view the Lamplugh Glacier. 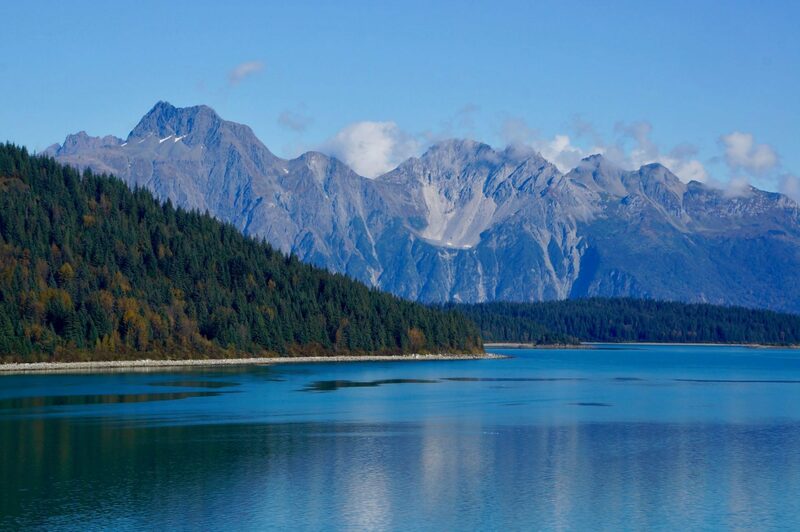 We continued to cruise through a mountainous scene that felt like we were drifting right into a postcard for Alaska. It left us breathless. Wow. This was Alaska in all of its glory. It’s amazing to think that the very waters we were traveling through had been entirely covered by one gigantic sheet of ice just a few hundred years ago. A few centuries earlier, this bay didn’t even exist. Looking at the ice-covered landscape, it’s not difficult to imagine. 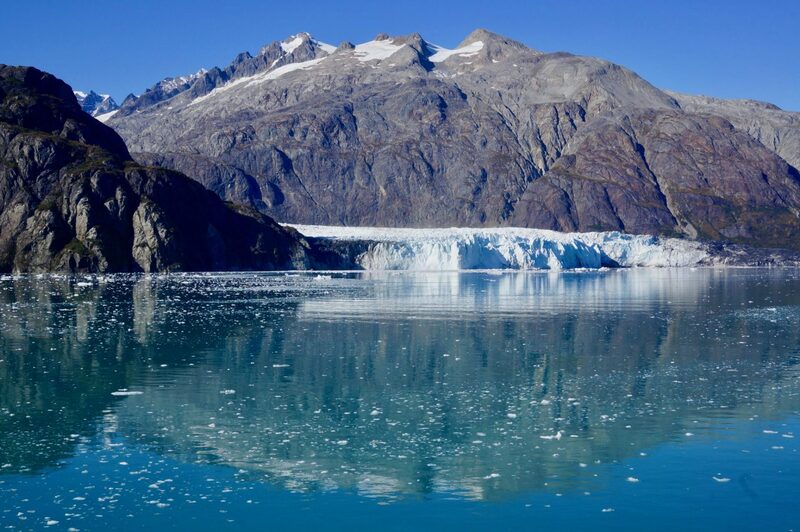 Even today, Glacier Bay is a part of the largest non-polar ice field in the world! We rounded a corner and set course towards the Grand Pacific and Margerie Glaciers. This was the end of the line and the deepest you can get into Glacier Bay. We marveled at the fact that the big ship managed to get within 400 meters (a quarter-mile) of this magnificent river of ice. 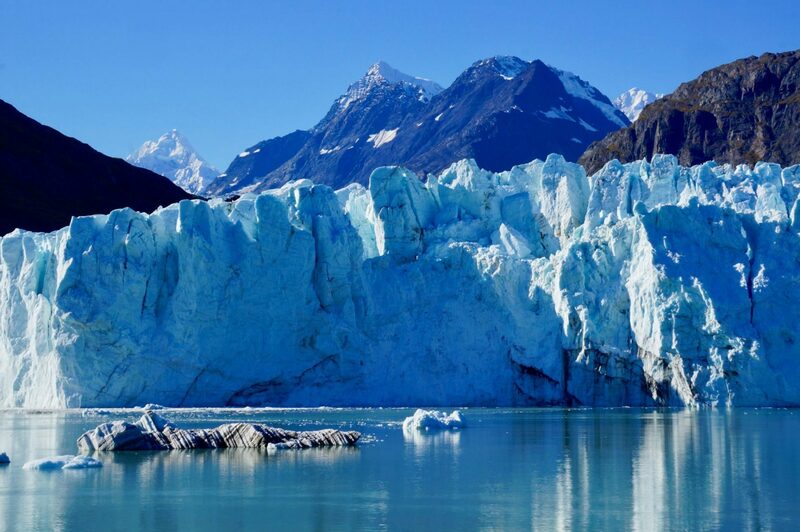 While many glaciers around the world are receding, the Margerie Glacier is remaining stable. Yet it still regularly calves icebergs into the water. The Volendam lingered in this spectacular vantage point making an ultra-slow rotation that lasted for nearly an hour to savor the view of this impressive glacier from many angels. 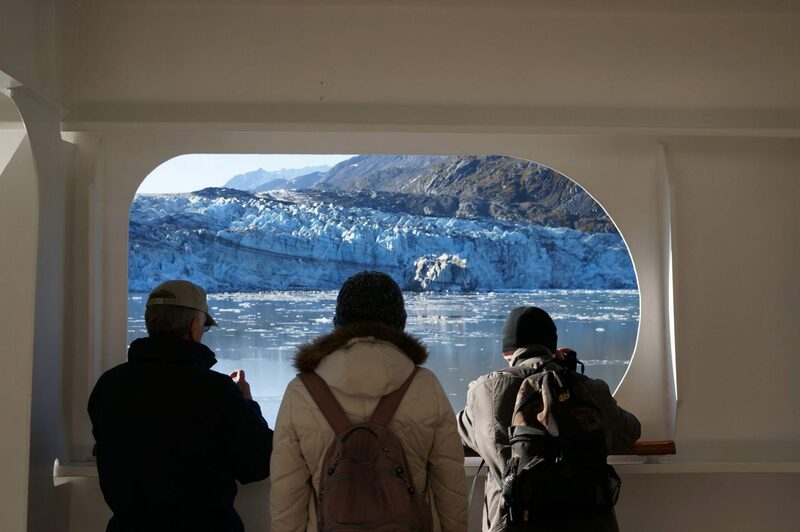 It gave an opportunity to see the glacier from high atop the upper levels of the ship and at eye-level on lower decks. Although the Volendam was carrying about two-thousand people, it was still easy to find quiet nooks throughout the ship. 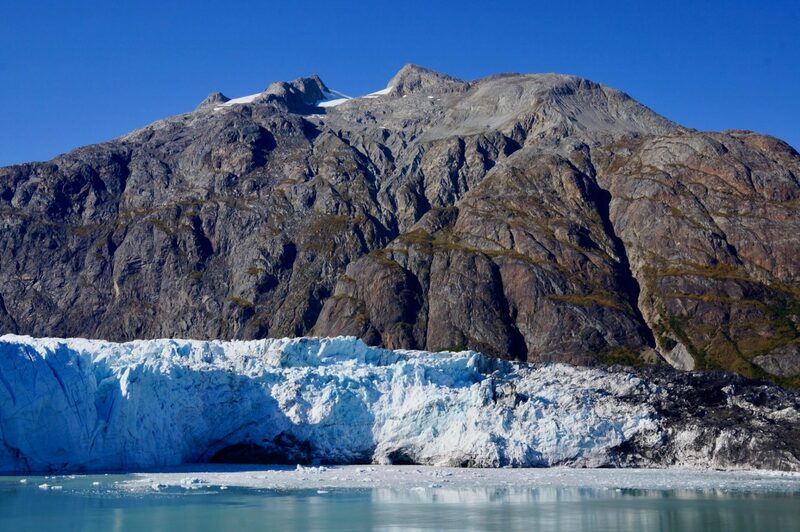 You could hear the creaking noise of this active glacier. 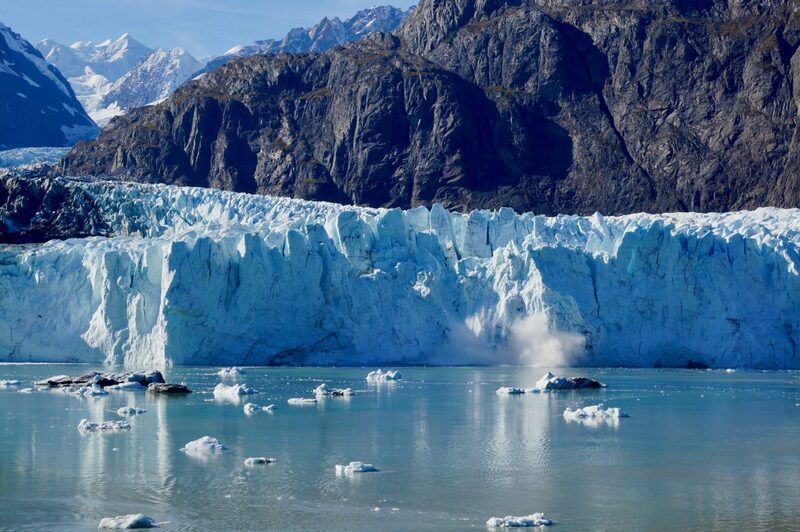 This pause at the Margerie Glacier also provided the chance to actually witness the glacier calving. But an hour into it, no calving ever happened. As we began to depart the glacier, it became apparent that we wouldn’t see this spectacle. Suddenly the glacier delivered a parting farewell, sending a huge chunk of ice loudly crashing into the sea below. Ripples of waves splashed in our direction. Mother Nature was putting on a show for us and this was an impressive final act. The amazing day wasn’t quite over though. There was still a long voyage to once again reach the mouth of the bay. 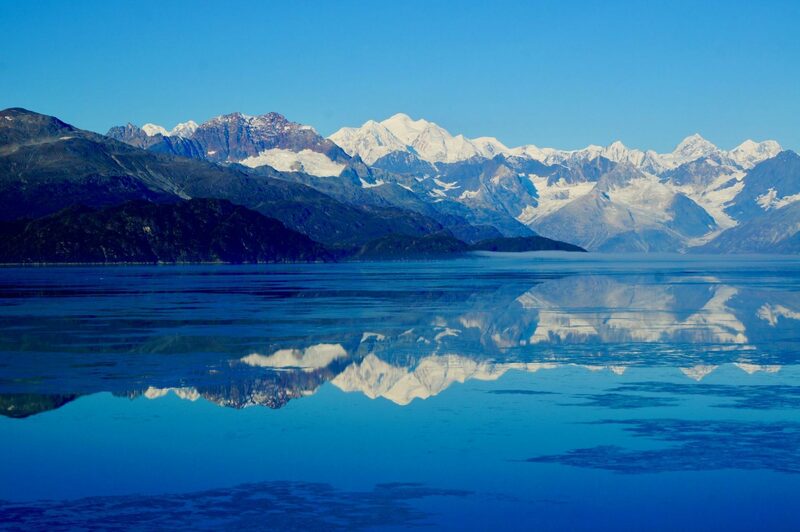 As people began to go about their day in the afternoon, we savored the fleeting scenes of Alaskan wilderness. Even as the park rangers departed and the sun got low towards the horizon, stunning Alaska views remained visible throughout the entire day. This would be our final day within the US until we make it back around to the Atlantic Coast, as we pursue a seemingly impossible travel goal of attempting a Cheap Cruise Entirely Around the World. We couldn’t envision a more stunning sendoff for a journey around the globe without flights. From Glacier Bay, we spent another week cruising on the Volendam clear across the Pacific Ocean. What a memorable sight to gaze upon these final glimpses of land before continuing onward all the way to Japan. 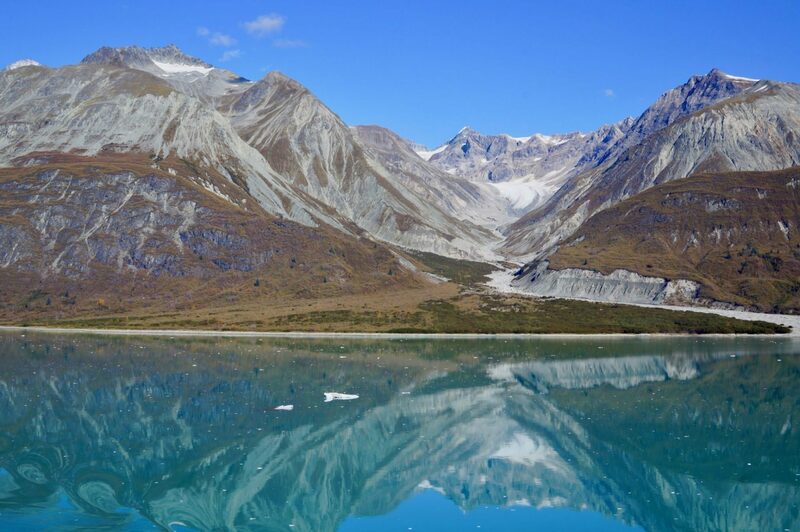 Because Alaska Scenery is Awesome! 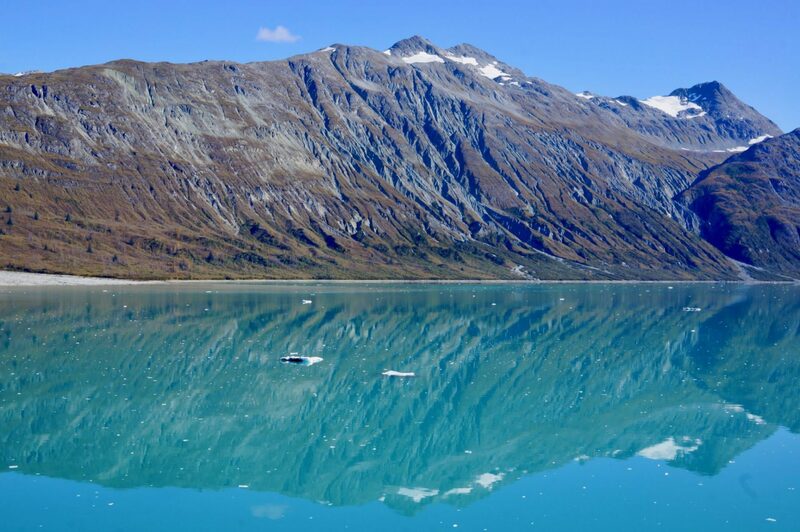 Glacier Bay is unique within the National Park system in that it is one of the few that is not connected by road. You must either fly in or arrive by boat. The majority of people visiting Glacier Bay National Park see it just as we did, by cruise ship. 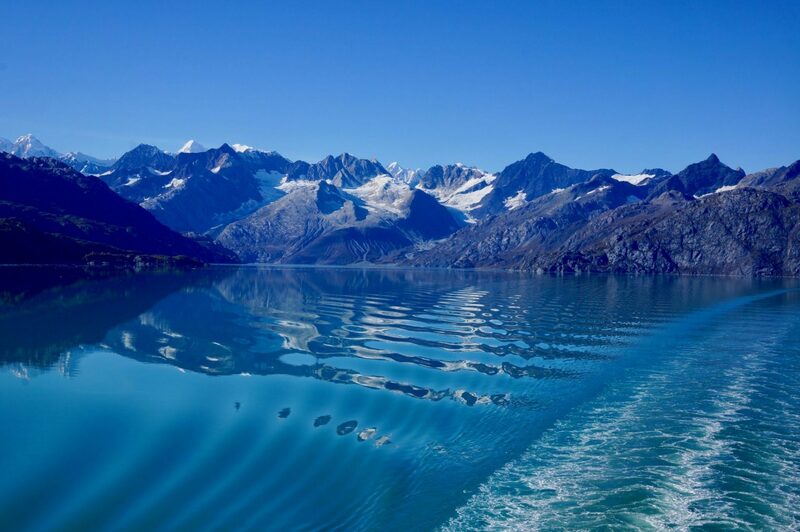 These Alaskan cruises including Glacier Bay only occur during the summer months, May-September. 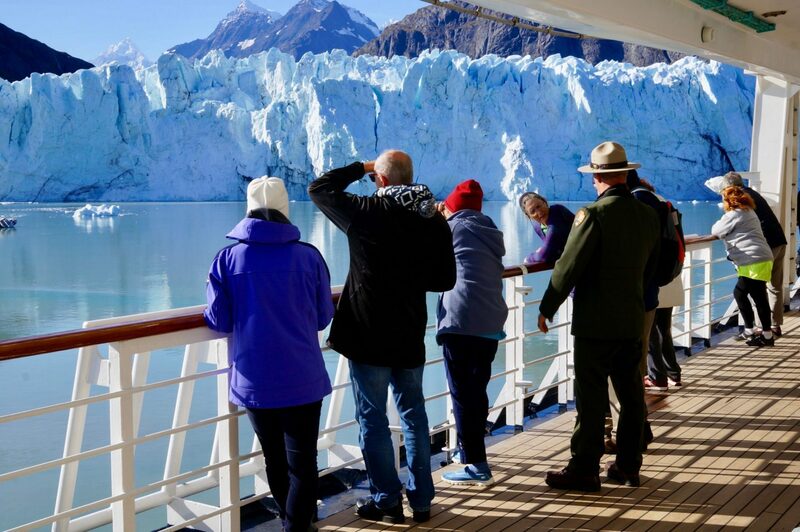 Budget travel tip: For a good deal on a cruise that goes to Glacier Bay, we suggest finding one that departs in May before Memorial Day or in September after Labor Day, when Alaskan cruises start at $500 plus port charges per person. In comparison, during peak summer months, these weeklong (or more) luxury cruises are typically priced well into the thousands of dollars. 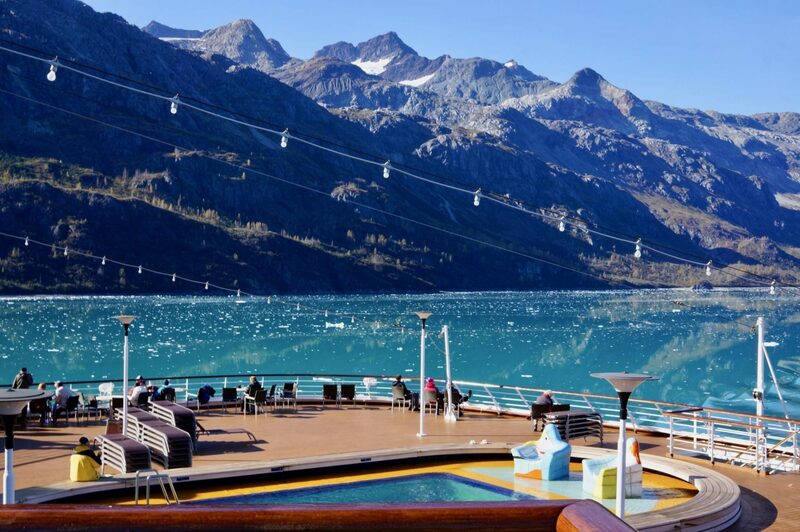 But during the shoulder season timing you can easily find many Alaskan cruises including Glacier Bay listed for less than $1,000 per person. Most Alaska cruises have 7-14 day itineraries that depart from Vancouver and Seattle to form a loop, returning to the departure city. 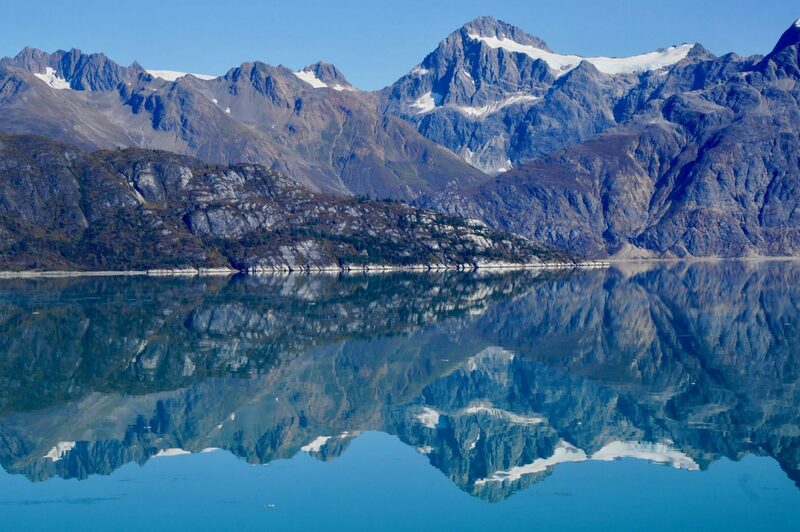 Another popular route that includes Glacier Bay is one-way between Vancouver and Anchorage. In May and September, you can also find longer repositioning cruises with particularly attractive rates on more exotic itineraries that may also include traveling to South America, going through the Panama Canal by cruise, or crossing the Pacific to/from Asia. The latter is what we embarked on. For more cruising tips, you can check out our Top 50 Cruise Hacks post. 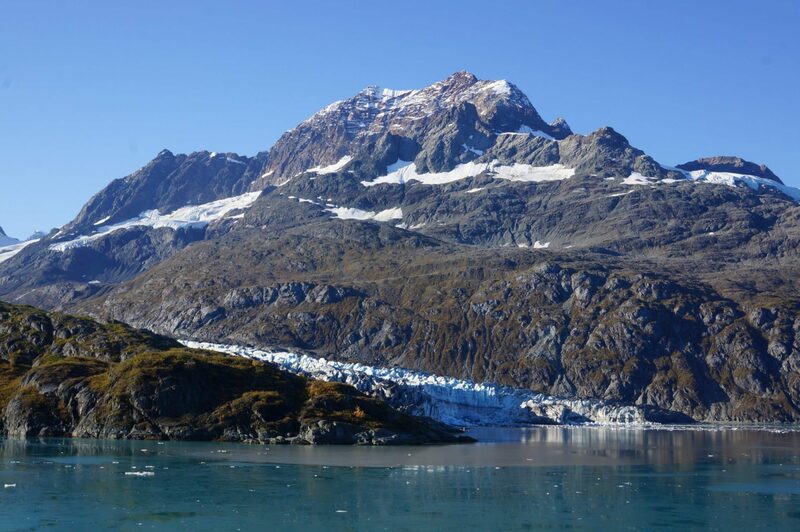 We went through Glacier Bay National Park on the Holland America Volendam, which we chose based on timing, price, and it fitting our need to get to Asia without flights. Overall we had a pleasant time aboard the Volendam, which was our first on the Holland America cruise line. It was a good experience, although there are other cruise lines that we’ve preferred more. For us, high points on the Volendam was the fantastic cuisine and the many varied enrichment activities. Low points for us was a dull entertainment schedule and an overall lack of fun vibe. Everything else was fairly standard, good quality, and enjoyable of what you’d expect from a 4½-star midsize cruise ship. It made for a particularly awesome way to cross the Pacific Ocean in style! 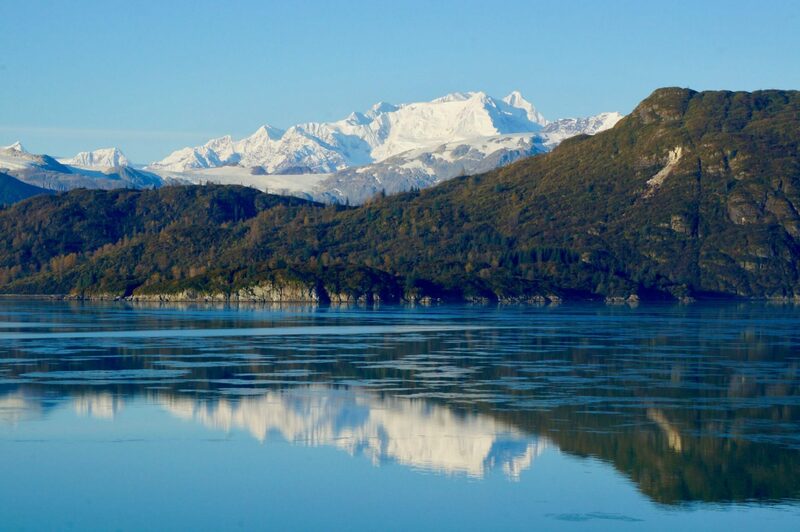 As it relates to Glacier Bay, the Volendam provided an excellent way to see this spectacular National Park. The ship never felt crowded and they were prepared to help passengers make the most of this day of scenic cruising. Small touches like having wool blankets available on deck chairs and hot mulled wine being served were noticed and welcomed. 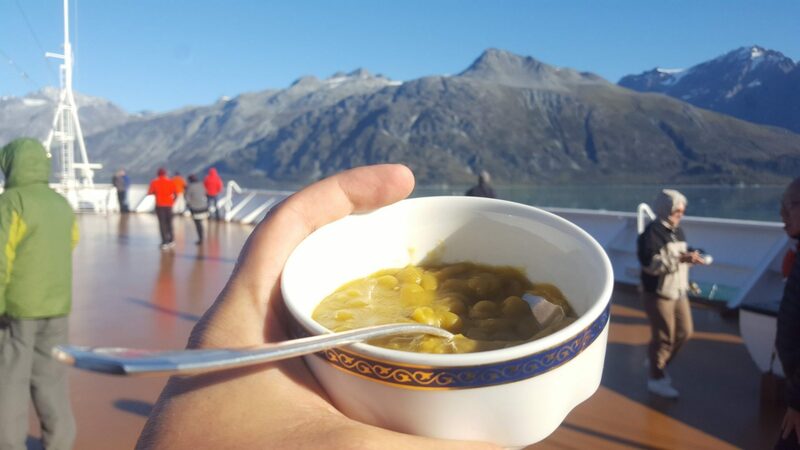 A novel custom that this Dutch line keeps up is serving hot Dutch pea soup on the bow of the ship while approaching the glaciers to help passengers keep warm. In the chilly weather it was a delicious tradition that we loved! 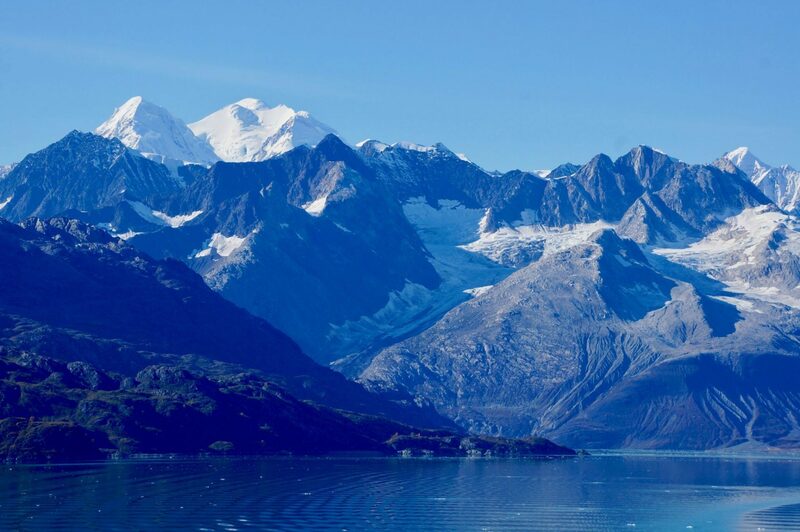 Overall, we certainly recommend cruising Alaska on the Volendam and give them a good review. 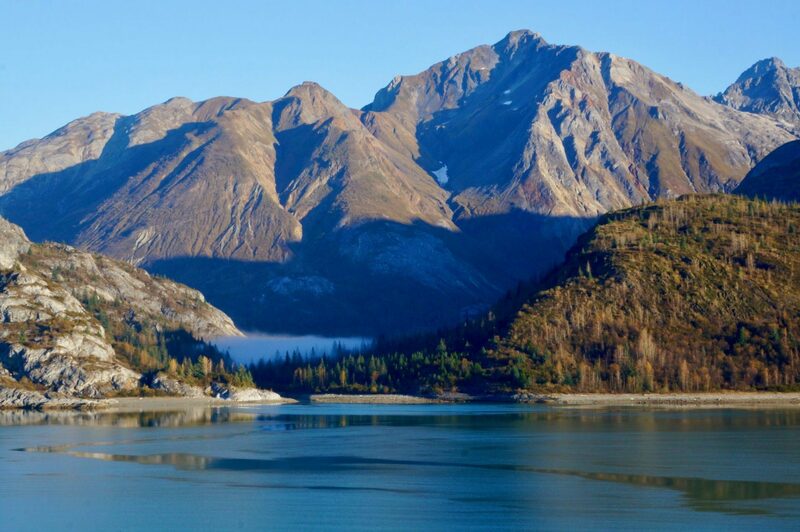 But really, we think just about any cruise on a day like this would provide for a great experience to witness the incredible beauty of Alaska! Photos were shot using our Sony DSLR camera. 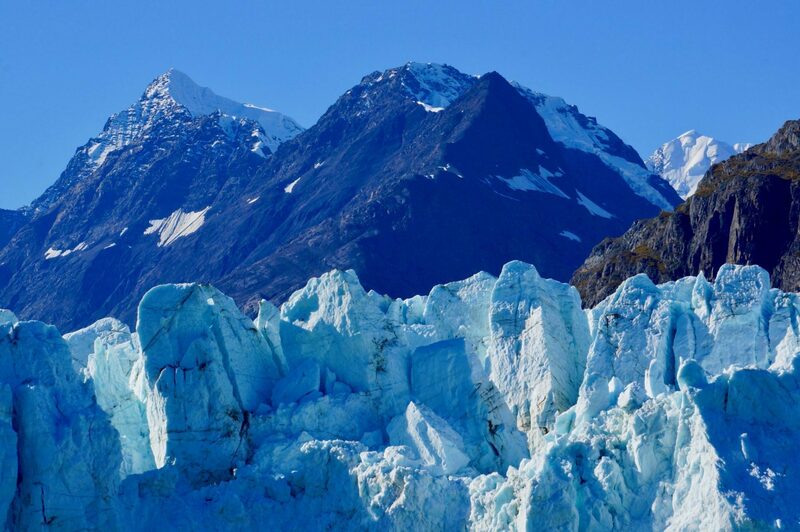 For best Glacier Bay photography, we recommend a camera with a good zoom lens. Also be sure to pack a decent pair of binocular so that you can see the onshore wildlife, whales, and glaciers up close. These Bushnell Falcon binoculars are great quality and an incredible price on Amazon. Check prices and recent reviews. For more cruise tips see: Top 50 Cruise Hacks. 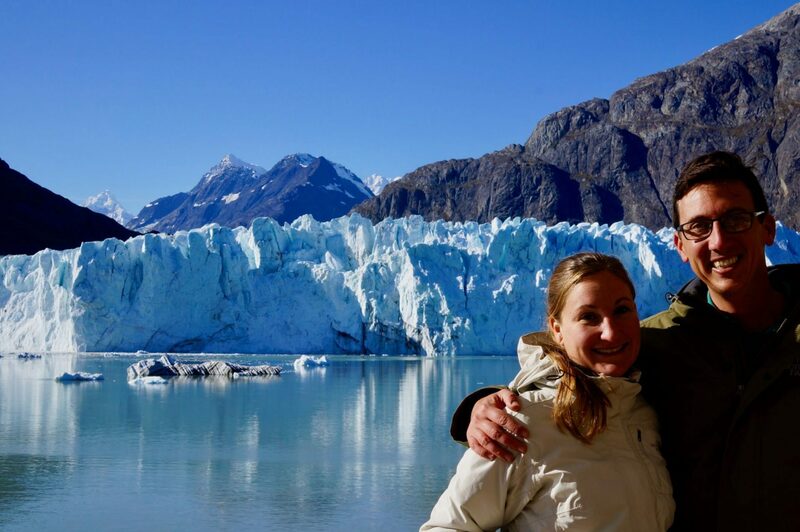 For more about how we pulled off a cheap cruise entirely around the world (which included this Glacier Bay cruise on the Volendam), you can see our detailed strategies and budget here: How To Plan A Cheap World Cruise.